The first picture above shows frost-heaved bedrock (height of foreground block ~60 cm), while the second picture shows a disrupted hillside (hill ~15 m high). Observations of lichen can help answer questions regarding the time (hence the climate) when these features were formed. For the frost-heaved bedrock, the key question is: Did all the frost-heave action occur thousands of years ago when the climate was much colder, or is the frost-heave process still operating in the present climate. For the disrupted hillside, the question is a bit more complicated. Is the feature the result of ongoing freeze-thaw weathering? OR Is the feature a consequence of a rockfall or landslide that occurred some time during the Holocene? OR Is the feature a result of frost wedging or plucking that occurred near the end of the Pleistocene? Questions like these will be considered in this section. 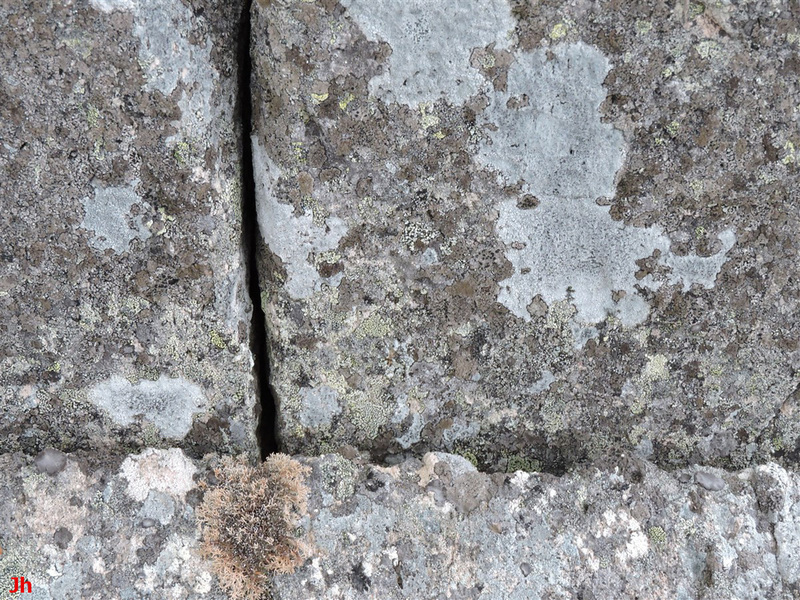 Lichen-covered frost-heaved joint blocks (height 80 cm) are shown in the above photo. Appearing below are closeups (second photo is detail of the first) of the bedrock/joint-block boundary on the right-hand side (not visible in above photo) of this specimen. There is no discernible variation in lichen coverage near the base of the specimen. This suggests that no upward movement (frost heave) has occurred within the last few decades. More pictures showing the bases of frost-heaved joint blocks are provided below. 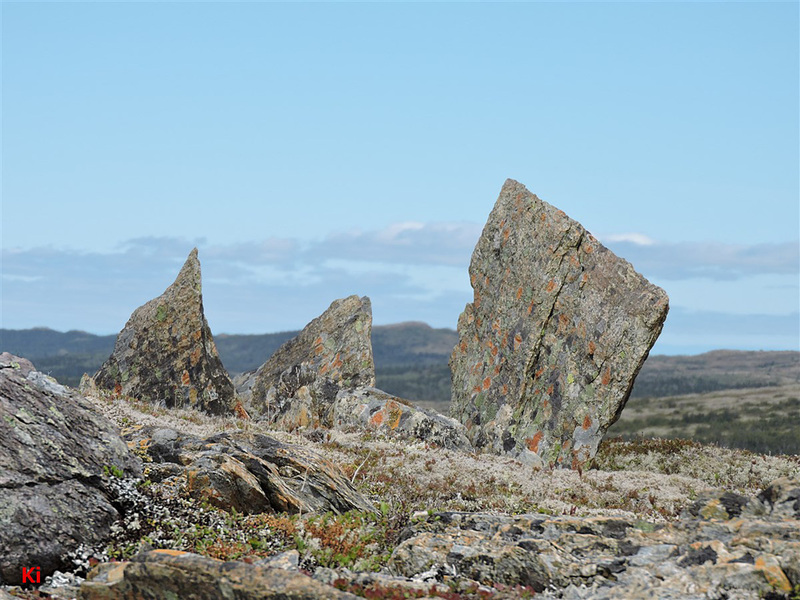 In each case, as above, the rocks were examined closely in the field to check for any disturbance in the lichen pattern near the base that might indicate recent movement. The frost-heaved joint block shown above (centered left-to-right in photo and extending off the top of the frame) is 110 cm tall. The lichen pattern around the base shows no evidence of recent uplift. 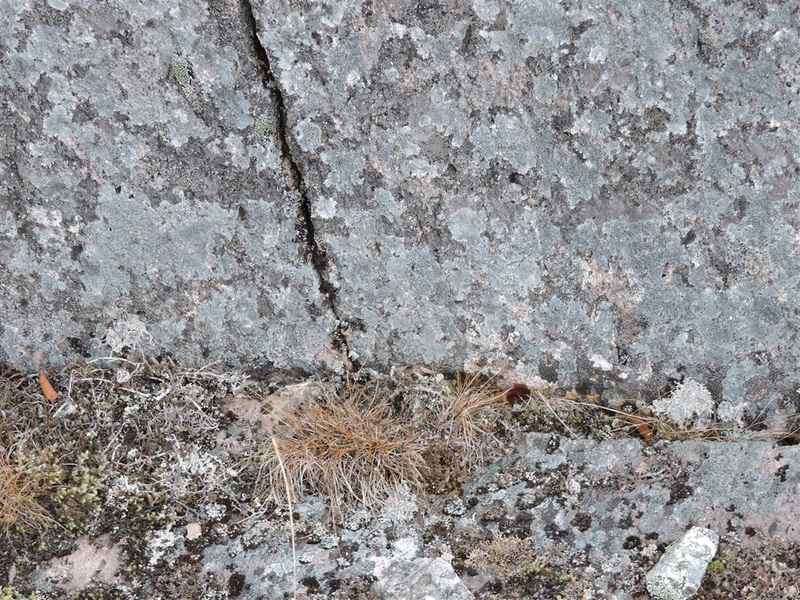 The frost-heaved bedrock shown above (~80 cm high, second photo shows detail) is part of a large group of associated ice-lifted blocks, none of which reveal any evidence of lichen variations that might reflect recent movement. 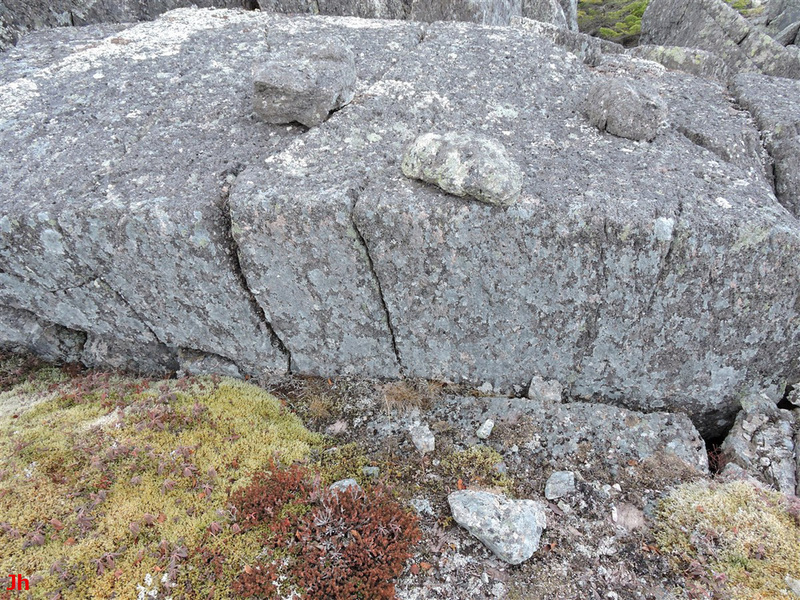 The above-pictured small (~30 cm high) frost-heaved blocks (second photo provides detail) show uniform lichen coverage extending to the base, suggesting no discernible uplift has occurred within the last few decades. 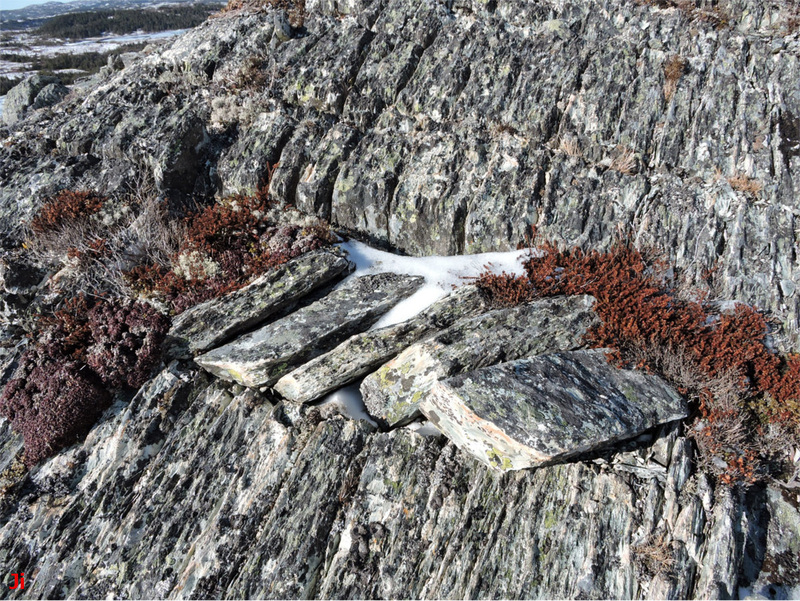 ﻿The slender sheets of frost-heaved bedrock (highest piece is 50 cm tall) shown above are coated with several different varieties of lichen. 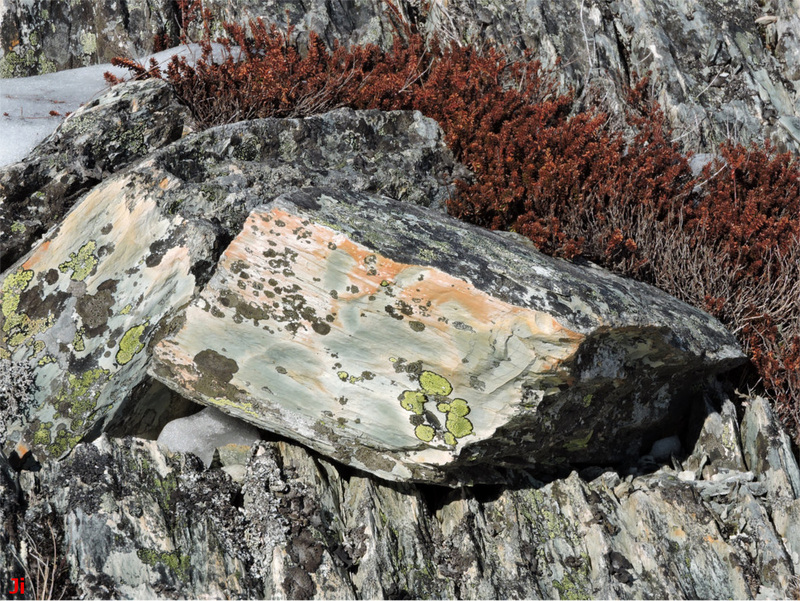 The lichen appears to grow undisturbed down to the bottom of the specimens, suggesting that frost-heave uplift in these rocks ceased at least several decades ago. 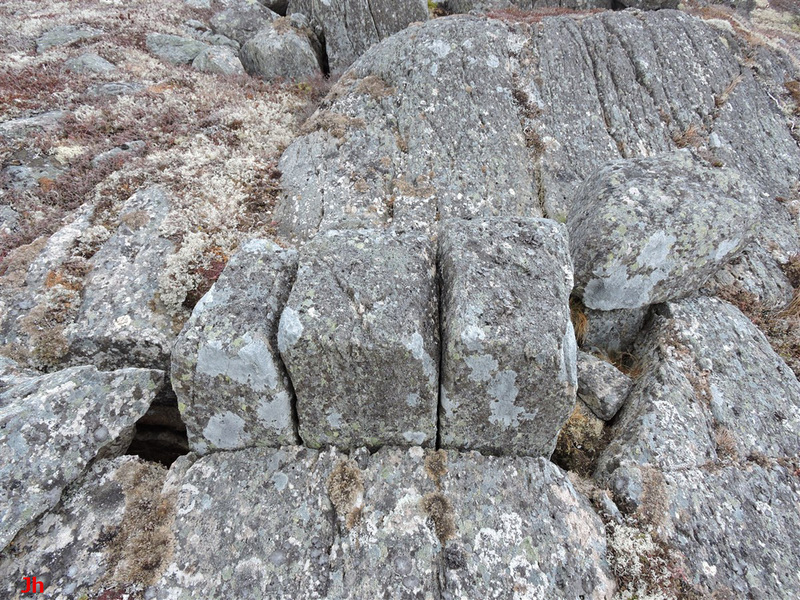 The following three photos show a group of five small (length of each piece ~35 cm) joint blocks displaced by frost wedging from a glacially smoothed bedrock surface. The prominent grooves in the bedrock result from ongoing rain erosion/minor frost wedging that enhances the underlying tectonically-induced foliation in this rock. 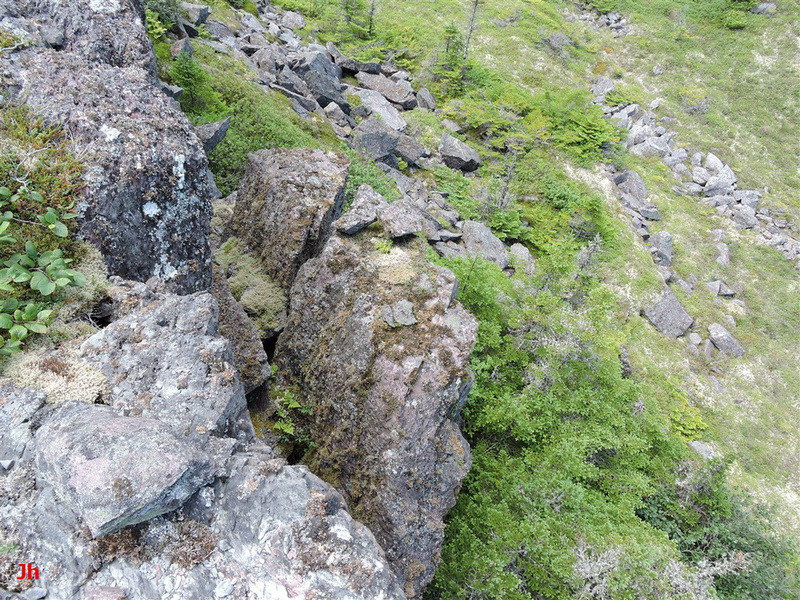 The end view of the right-most block shown in the last (right, bottom) photo reveals an incomplete lichen coverage that could imply recent origin for this frost-heave feature. 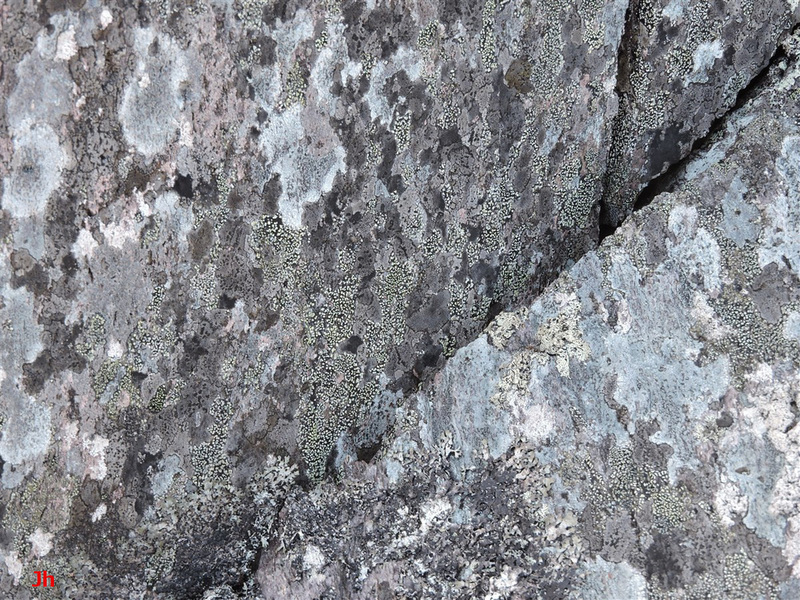 However, the top of the right-most block is densely covered with lichen, contradicting this conclusion. What is now the top surface of this block was a side surface (hence not exposed) before frost heave occurred. The block second from the left also shows a densely lichen-covered former side surface. These observations leave open the possibility that this frost-heave feature is pre-Holocene and that differences in orientation or rock texture on the end surfaces account for the relative lack of lichen. 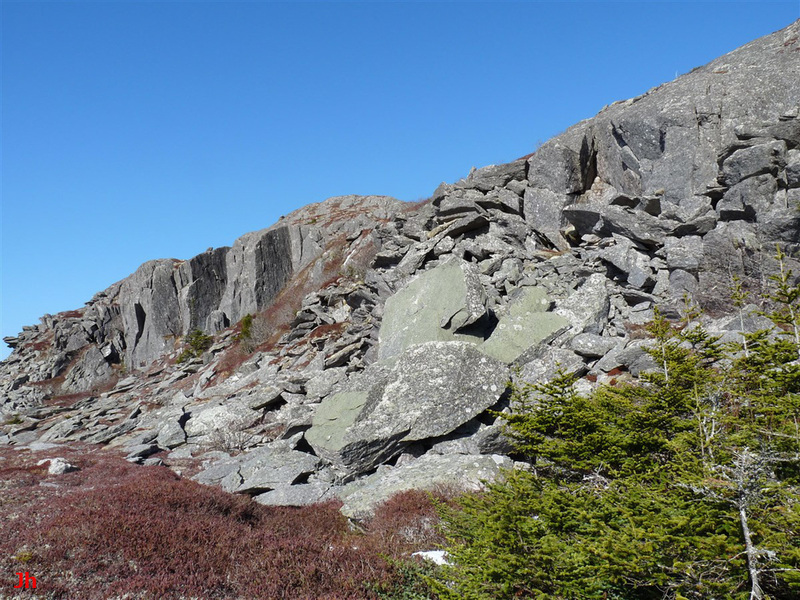 Observations of lichen growth on hundreds of frost-heaved bedrock specimens have failed to provide any examples of where changes to lichen appearance near the base of the specimen point to recent or ongoing uplift. It is concluded from these observations that frost-heaved bedrock is not a recent phenomenon and is probably an inactive process under presently existing temperate climate conditions. 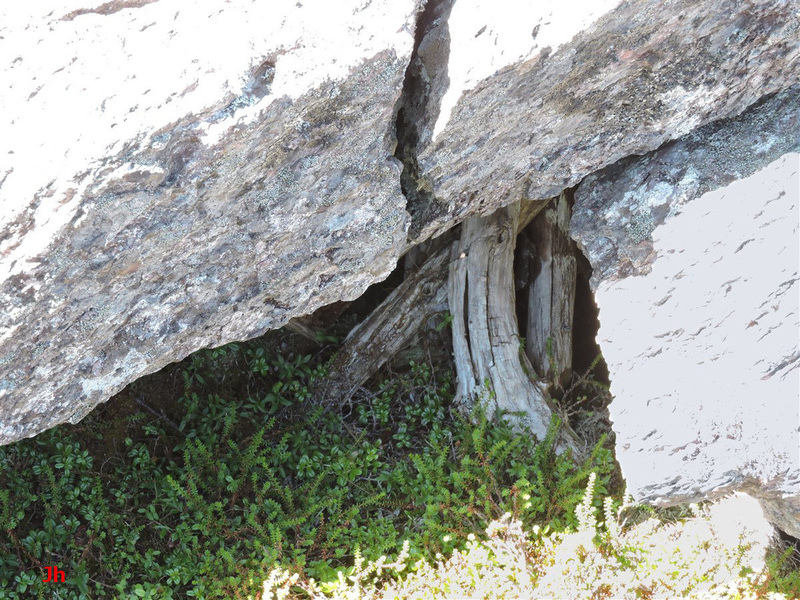 This makes frost-heaved bedrock on the Avalon Peninsula a likely indicator of a relict periglacial climate. 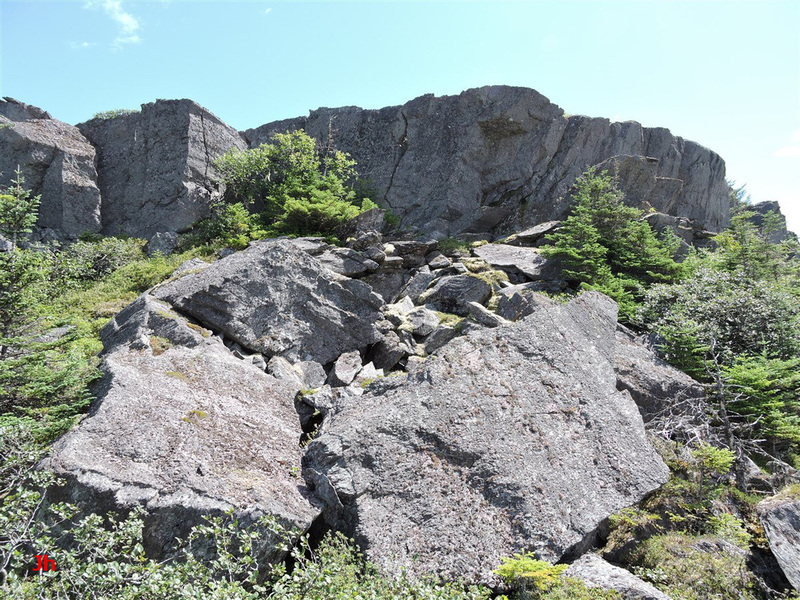 Two examples of recent rockfalls from ice-disrupted hillsides will now be described. These are presented as exceptions to the norm. In each case there is evidence to indicate that a rockfall occurred within the last century. 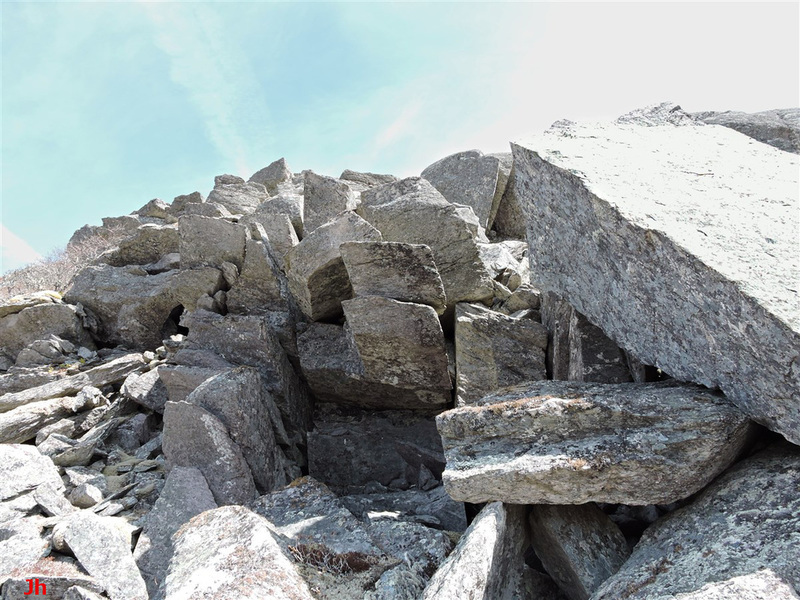 These rockfalls were found after inspecting many hillsides/cliffs and concluding that, while ongoing mass wasting is easily recognized at several locations (see Freeze-thaw Weathering), significant one-time rockfalls are either rare or else hard to recognize. Whenever a large amount of rock debris is seen at the base of an ice-disrupted landform, it seems hard to discount the likelihood that pre-Holocene glacial/periglacial activity accounts for most or all of the erosion. ﻿The photo above shows a 20 m high ridge that was originally smoothed by basal-slip glacial erosion. Subsequently, the face illustrated in the photo was intensely disrupted by glacial and frost-wedge processes that show evidence of post-dating the warm-based glaciation that originally carved the ridge. Detailed analysis of this particular landform will be provided in a subsequent section of the Frost-heaved Bedrock Field Observations topic (pending). A group of large recently-fractured boulders can be seen in the center foreground. 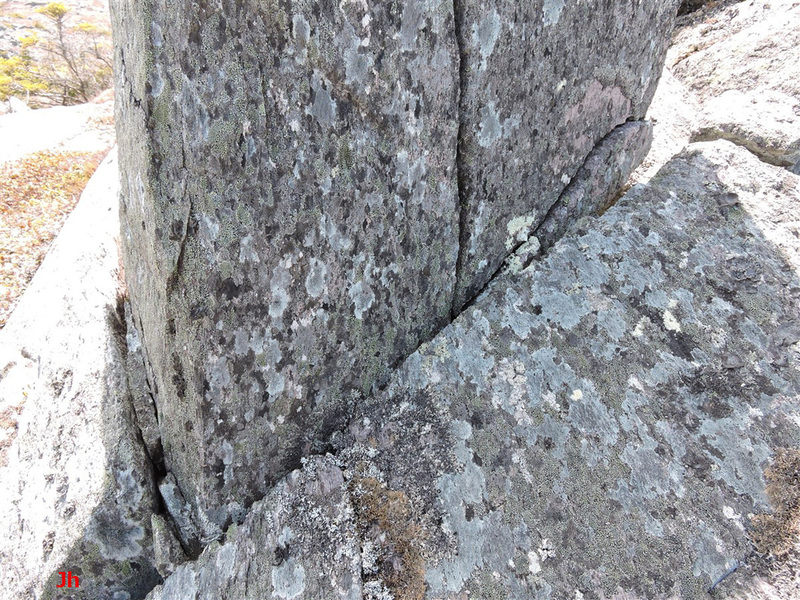 This is an instance where discontinuity of lichen coverage provides clear evidence of a recent rockfall. 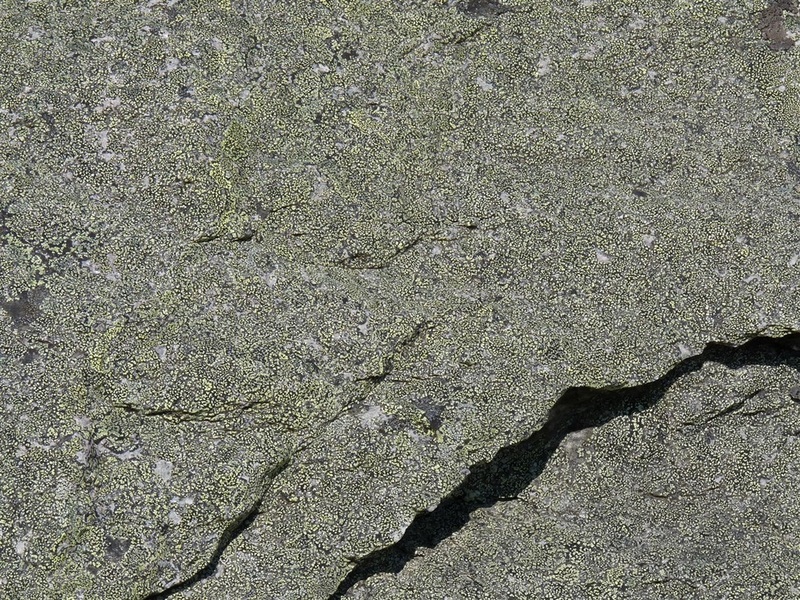 The first (left) picture above shows a 27 cm long hammer (center of photo) for scale, while the second (right) photo shows the boundary between an older surface (light green rhizocarpon geographicum lichen) and a more recently exposed surface (grey and white with lesser rhizocarpon geographicum). The above picture shows the density and uniformity of rhizocarpon geographicum coverage on the old surface, unusual for the lack of diversity in lichen coverage and for the even distribution of a lichen type that more commonly is seen in intermittent patches. The growth is made more puzzling by the lack of dominant rhizocarpon geographicum on any of the surrounding rock surfaces, even those surfaces that clearly have not shifted recently. 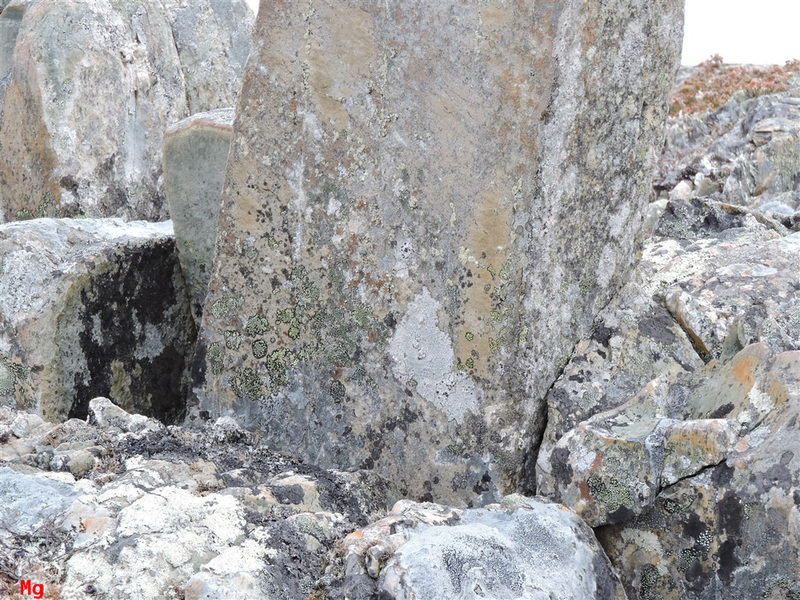 The seemingly plausible explanation for the special lichen coverage on the fallen rock slab is that prior to collapse the slab was suspended at a favorable orientation with respect to sun exposure and rainfall drainage. Several other large slabs of rock along this particular ridge are suspended at precarious odd angles, a result of late Pleistocene ice creep and frost-wedge action. 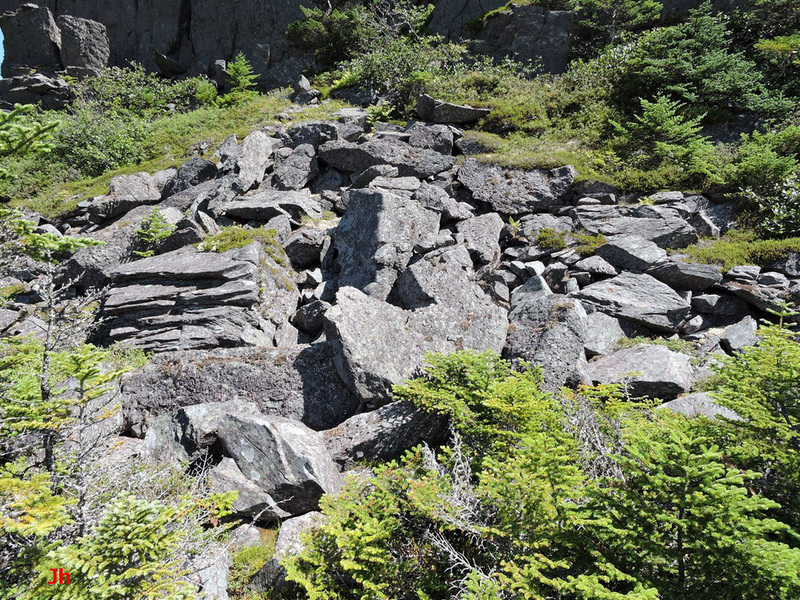 The above pictures are provided to help distinguish between rocks placed by pre-Holocene glacial and frost-wedge action and those placed by catastrophic collapse in recent times. 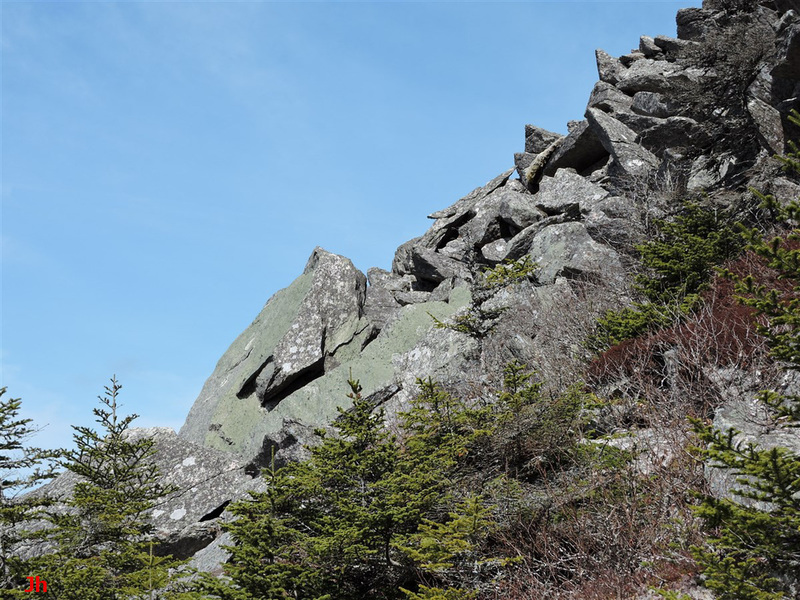 Note the occurrence of generally aligned wedge-shaped rocks oriented with an upward slope. 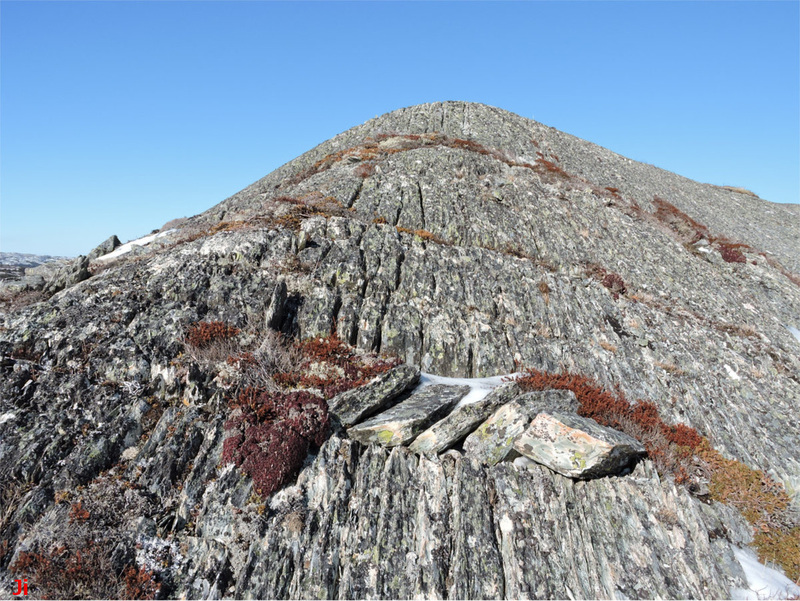 These are the less-shifted or unshifted rocks remaining undisturbed since their placement under glacial and/or periglacial conditions. 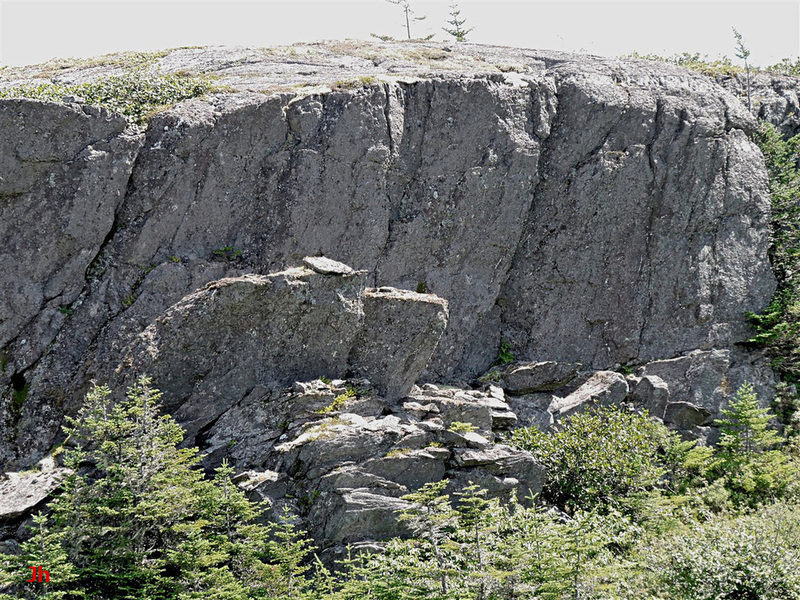 (See discussion, with diagrams, in section Frost-wedged Hillsides, pending) The slabs from the recent rockfall lack the characteristic shape and general alignment of the precursor rocks. Furthermore, these slabs are oriented as would be expected after sliding downslope. Note, for example, the large slab at the right-hand edge of the second (right) photo (color of lichen on top of slab bleached out by overexposure). A second example of a recent rockfall is shown in the picture below. The overall height of the flat-topped ridge above the foreground grassy area is about 14 m. The vertical drop of the cliff above the top of the sloping broken rocks is about 6 m. There are three features of interest, leftmost an apparent rockfall, center an assembly of slabs tilted outward from the cliff face and, right, another smaller apparent rockfall. Two photos of the center assembly of rocks are shown below. These rocks appear to have been shifted into their present position by glacial ice flow. Note the loose rocks on top of the biggest slab in the assembly. Assuming these rocks were deposited by ice, their continued presence would indicate low likelihood of catastrophic shifting of this rock slab following its initial placement. The first (left) photo below shows the possible rockfall appearing at the left of the group of three features, while the second (right) photo shows the highly probable rockfall at the right of the group. 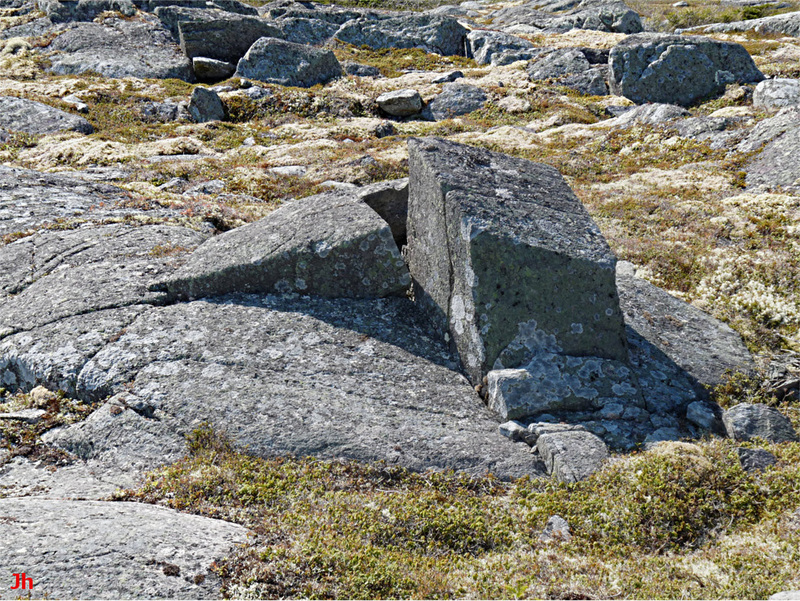 Scale in the two photos is comparable and the big slabs in the first photo have horizontal dimensions of the order of 3 m.
Note the irregular "C"-shaped rock at the approximate center of the second (right) photo above. Underneath this rock are the stumps of small dead trees, apparently crushed when this rock tumbled into its present position. These crushed tree stumps are shown in the photo below. The tree stumps shown above are in an advanced state of decay, indicating they are several decades old. 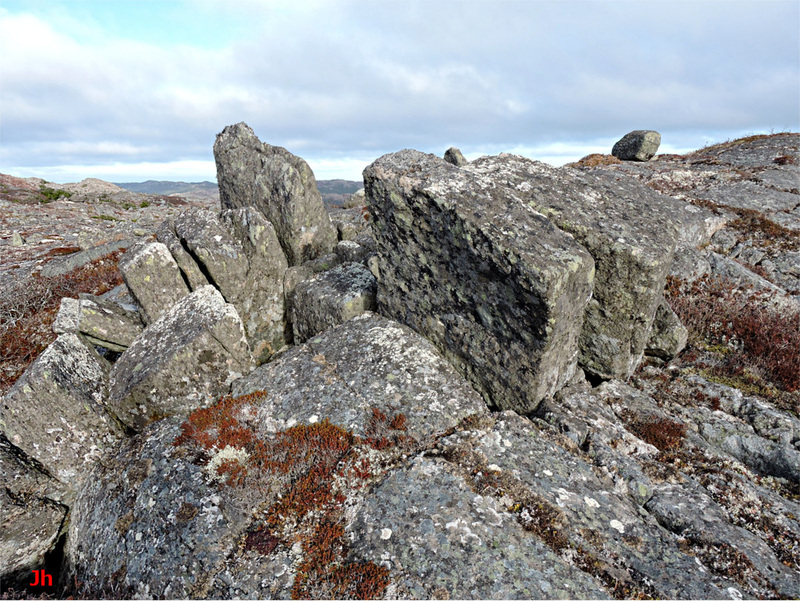 This finding of crushed tree stumps was unique in ten years of observations on the Avalon Peninsula, demonstrating the rarity of recent rockfalls from the glacially shaped cliffs in the region. 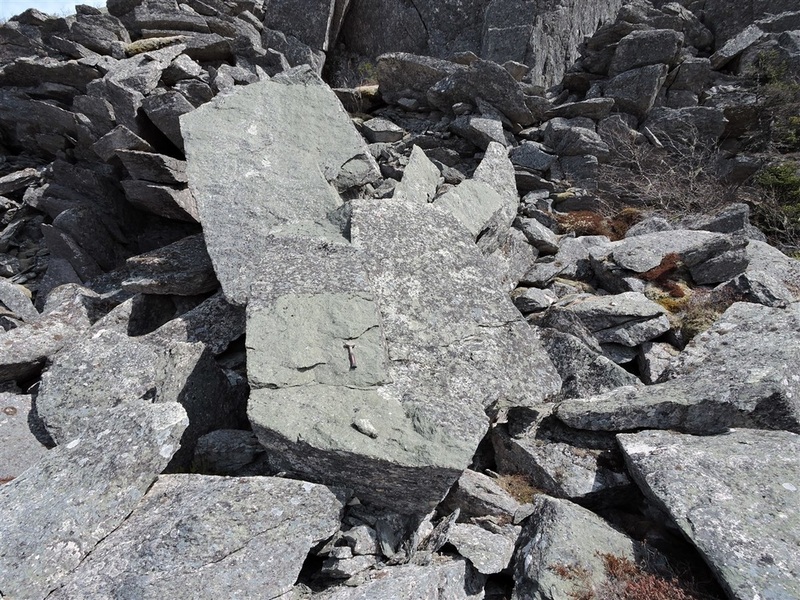 Unlike the first-presented example of a recent rockfall, this second example lacked conclusive lichen-based evidence of recent rock breakage. 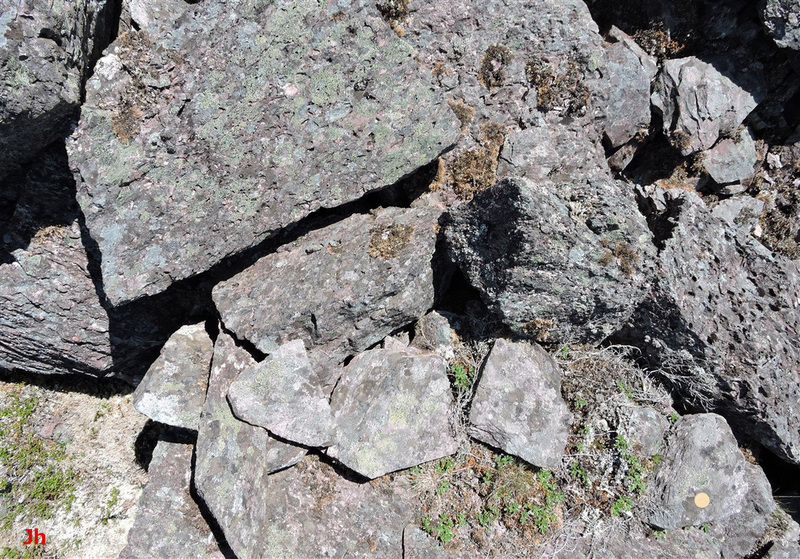 The photos below illustrate possible discontinuities in lichen coverage, although these were identified only after the crushed tree stumps were found. Both of the above photos relate to the larger (leftmost) potential rockfall as described above. The first (left) photo shows a 1 m wide view of the edge of a large slab of rock. The lower (light grey) part of the surface may be a recently exposed surface. Aside from differences in lichen coverage, the upper part of the surface is much more deeply eroded than the lower part. The second (right) photo shows loose boulders (coin at bottom right is 2.5 cm dia. ), with the rocks in the bottom half of the picture being noticeably smoother (less deeply eroded) than the rocks in the upper half. As with the first photo, the smoother, lighter-colored rocks may represent recently exposed surfaces. 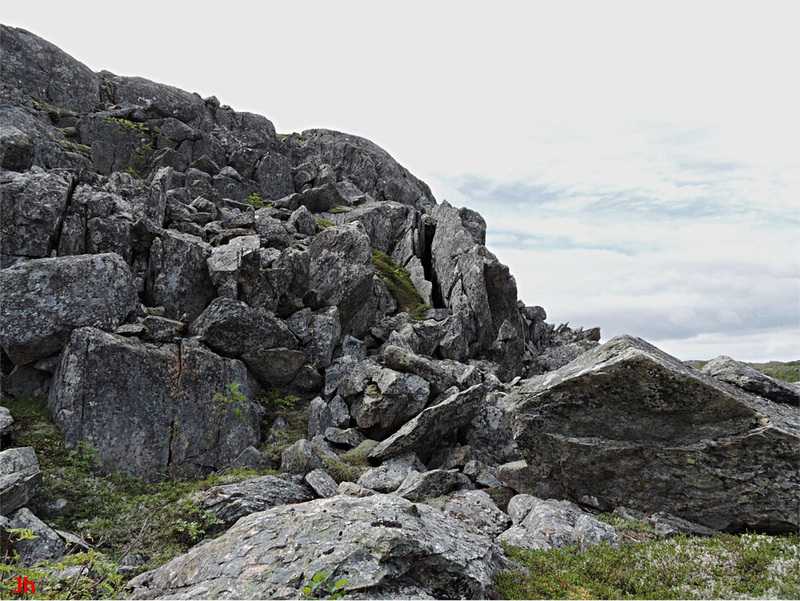 Many other suspected boundaries between old and new surfaces in the potential rockfall (leftmost) and probable rockfall (rightmost) did not show such clear evidence of erosion/lichen discontinuities as are illustrated in the two pictures above. 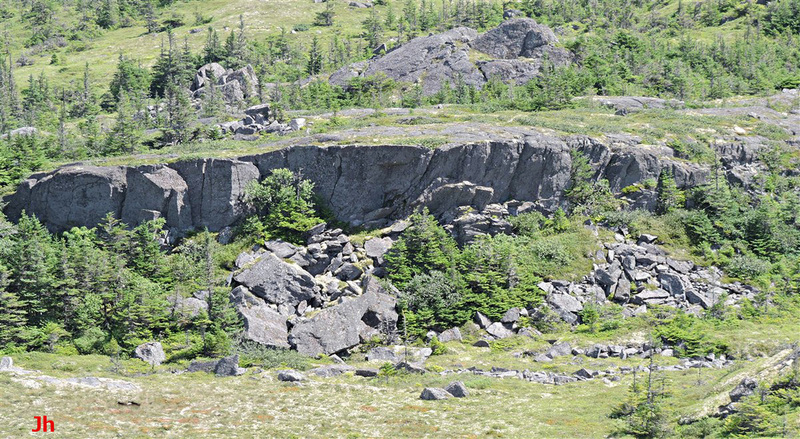 ​In summary, it appears that the landforms discussed above were sculpted primarily by glacial activity and/or by frost wedging and that this is typical for most inland rugged hillside landforms on the Avalon Peninsula. In a few instances, unstable rock formations left behind by glacial/periglacial activity have subsequently collapsed in localized rockfalls. 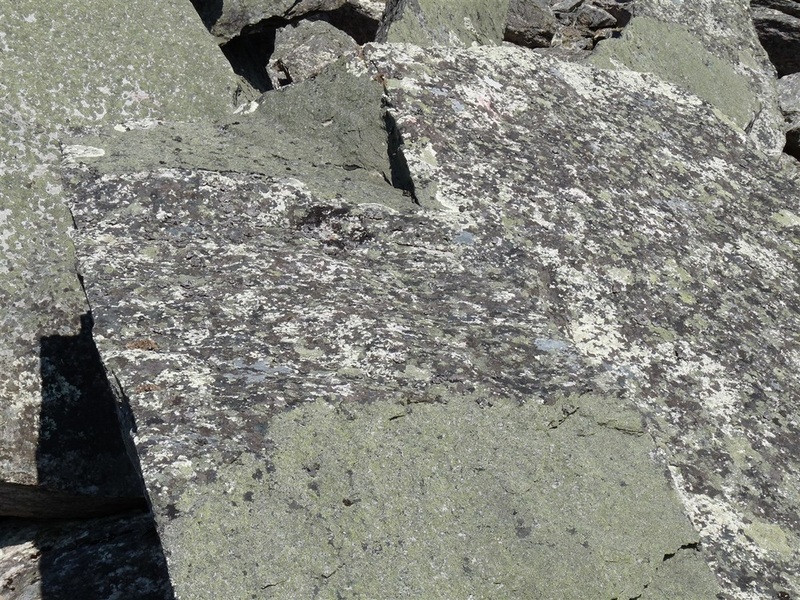 If recent, these rockfalls can sometimes be identified by noticing abrupt variations in lichen coverage. Although seismic activity is low in the Heart of Avalonia region, it is not negligible. On Nov. 18, 1929, a magnitude 7.2 earthquake occurred at a depth of 20 km below the sea surface at 44.54 deg. N, 56.01 deg. W. This earthquake was centered about 380 km offshore from the Isthmus of Avalon and would have produced significant ground motion at the locations where the two above-noted rockfalls occurred. The possibility that one or both of these rockfall events was triggered by the 1929 earthquake cannot be eliminated. There is no record of previous significant earthquakes having occurred in the region during the Holocene, but this result would primarily reflect lack of human settlement over most of the interval. On Apr. 28, 2009, a magnitude 3.3 earthquake occurred, centered near the central-Avalon community of Whitbourne. This event generated perceptible ground shake in a few nearby areas. A check of some known precarious glacial rock formations done in the weeks following showed no effect from this very minor earthquake.